The Re-imagining The Rail Corridor exhibition showcases some early ideas from students and design professionals for what the future of the Rail Corridor could become, in a bid to anchor Singaporeans with a stake in their surroundings and to build-up engagement with the public in jointly designing the spaces around us. Singapore Botanic Gardens (Function Hall of Botany Centre, near the gate opposite Gleneagles Hospital). Opening hours from 8:30am to 6pm. By Channel NewsAsia, 3 Oct 2011. An exhibition that explores several ideas on how different pockets of space at the former Malaysian railway land can be used was held on Monday. The initiative is part of a series of events dedicated to increasing public awareness of the tract of KTM railway land returned to Singapore. Called “Re-Imagining the Rail Corridor” the exhibition showcased some preliminary ideas from architecture and landscape students as well as design professionals. Minister of State for National Development Brigadier-General (NS) Tan Chuan-Jin, who chairs the Rail Corridor Consultation Group, said he hopes the final design will incorporate all ideas that the Urban Redevelopment Authority has been receiving. 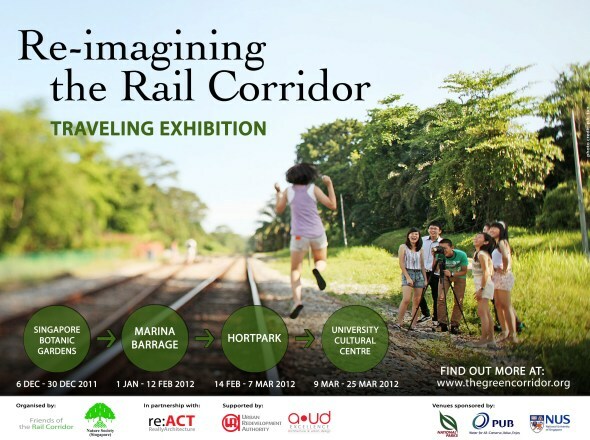 Re-imagining The Rail Corridor is envisioned as a series of events dedicated to enhancing the public awareness and understanding of the tract of KTM railway land recently returned to Singapore. The events comprise of an exhibition, a design workshop and a public forum, intended to explore, encourage and develop creative ideas for incorporation into the future of the Rail Corridor. The events revolve around six key themes: Ecology, Heritage, Recreation, Transport, Education and Community Gardening. Through these themes, it hopes to shape our understanding of and give insight to a rare piece of our cultural and natural heritage amidst our urban landscape, and to spark interest in the protection and preservation of this heritage as an extension of our national identity. The exhibition will showcase some early ideas from students and design professionals for what the future of the Rail Corridor could become, in a bid to anchor Singaporeans with a stake in their surroundings and to build-up engagement with the public in jointly designing the spaces around us. 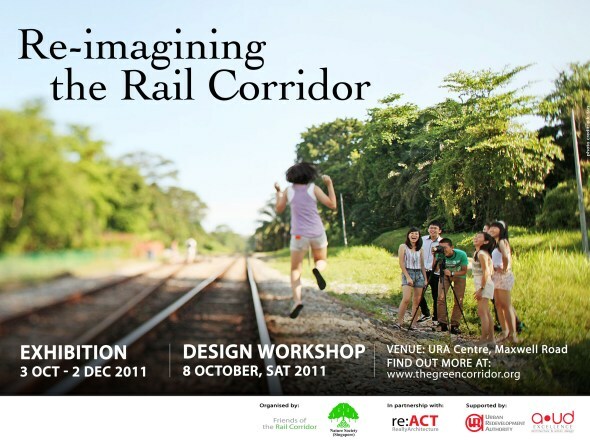 The 1-day design workshop seeks to foster the imagination of students, designers and interested members of the public of what the future of the Rail Corridor could become. There will also be a public critique session at the end of the workshop for a larger public audience to actively engage the workshop participants in the ideas put forward. Pls pre-register for this design workshop either as a Workshop Participant or as a Workshop Public Critique Participant below. Open for registration below. Limited seats. *Participants should be preferably available for a site recce and briefing on Sat 1 Oct at 9am. *No need to register for this public critique segment if you have already registered for the workshop above.